Bus services in Sydney are operating well and are set to improve when compared to a survey of US bus operators showing what changes had been effective in improving travel times. However, the lack of traffic light priority, no plans for all door boarding for buses, and inability to design new motorways for express buses means these improvements will not be as effective as they otherwise could be. More than half of agencies have thinned bus stops, some by focusing on pilot corridors, and others by gradually phasing in policy changes. Many agencies moved stops to far side of intersections at stoplights, and 13 agencies adopted physical changes like longer bus stops or bulb-outs, which help passengers board faster and more conveniently. Bus stops in Sydney are generally not found clumped together with 100m or 200m between them. 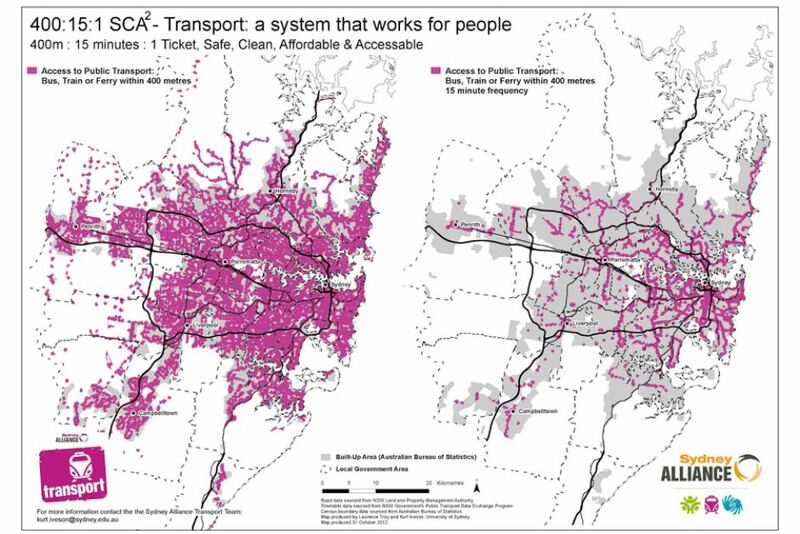 However, the current plan is to ensure that bus stops are placed every 400m for most bus services, with “Rapid Bus” corridors having bus stops every 800m to 1km (Source: Transport for NSW, Sydney’s Bus Future, p. 6). Bus bays are also quite common. Verdict: Currently often good, but being improved. Straightening out routes, trimming deviations, eliminating duplication, and shortening routes didn’t just simplify service, it also sped up service for two-thirds of the agencies that tried this approach. Much of Sydney’s inner suburban bus network is a continuation of its old tram network, parts of which have been around for 100 years or more. The result is a tangled web of bus routes that are hard to interpret, include many deviations, and are often duplicated. 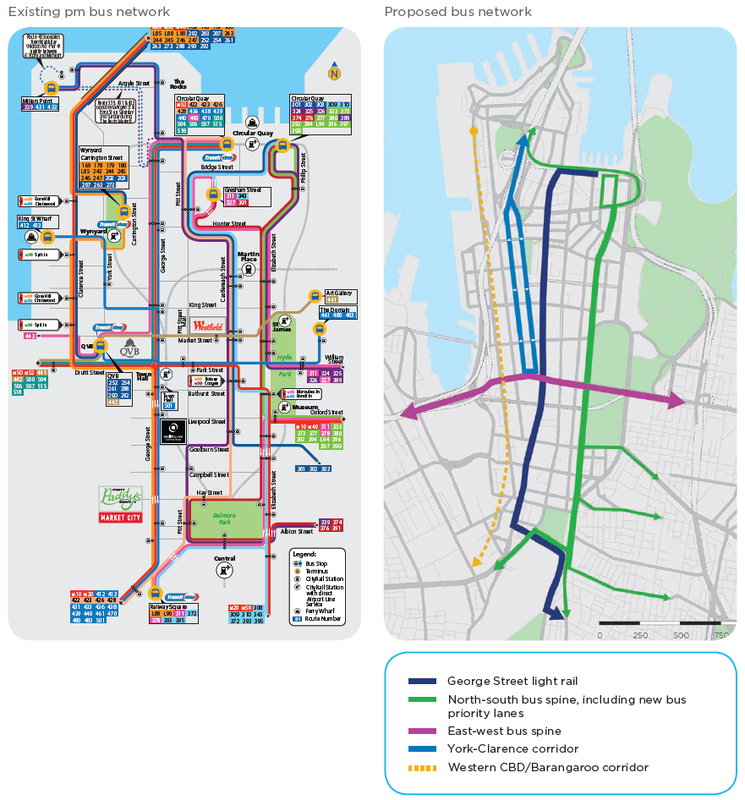 Current plans involve simplifying the bus network to make “routes more direct, reduces duplication and increases the number of locations which customers can travel between by bus” (Source: Transport for NSW, Sydney’s Bus Future, p. 5), though details have been light beyond proposals for changes to the bus network following the opening of the CBD and South East Light Rail (CSELR) at the end of the decade (see image above). Proposed changes to the suburban bus network with the CSELR have more details, but as with the CBD changes these are 5-6 years away and are far from guaranteed. Verdict: Currently not being achieved, the goal is in the right direction but plans are still sketchy. The 22 agencies with signal priority can change stoplights for approaching buses. They mostly report a minor to moderate increase in bus speeds as a result. In fact, agencies singled out traffic engineering approaches like TSP as the closest to a “silver bullet,” one-step solution. Traffic light priority for buses is theoretically possible in Sydney, but has been opposed by the RMS (and the RTA before that). Plans to introduce traffic light priority for the Parramatta to Rouse Hill T-Way were scrapped when it opened in 2007 because of RTA opposition. This remains the single improvement that could potentially provide the biggest improvement that has yet to be even partially implemented. Verdict: This has been a missed opportunity. Several agencies changed fare structures or payment methods. The one agency that collects fares before passengers board, and lets them board at both bus doors, decreased bus running times by 9 percent. Prepayment of bus fares was first trialed in Sydney in 2004, and has since been expanded to a number of bus routes and bus stops in high patronage areas of Sydney (Source: Sydney Buses, Prepay). The rollout of Opal readers to all buses during 2014 will further expand prepayment. However, there have been no announcements or plans to allow all door boarding of buses once Opal is fully rolled out. Verdict: Good progress on prepayment of fares and introducing Opal, but could be better with all door boarding. Ten agencies combined multiple approaches on specific routes and launched BRT service. Of those that measured the impact, almost all reported a significant increase in speed, typically around 10 to 15 percent. Bus Rapid Transit (BRT) was first introduced to Sydney in 2004 with the Parramatta to Liverpool T-Way, then added to in 2007 with the Parramatta to Rouse Hill T-Way (Source: Roads and Maritime Authority, Sydney’s T-Ways). There were originally plans for additional T-Ways connecting Strathfield to Parramatta and then onto Blacktown as well as between St Marys and Penrith as well as others (Source: Transport Sydney, New Transport Plan for Sydney). Today, other corridors are under consideration for BRT or light rail, including Parramatta Road, Victoria Road, Anzac Parade, and the Northern Beaches (Source: Transport for NSW, Sydney’s Bus Future, p. 6). Verdict: Positive achievements in the past, with a promising future of further expansion. More than half of agencies have moved to low-floor buses, which reduce loading times by one second per passenger. Smaller buses might be more maneuverable in traffic, and ramps can speed loading for wheelchairs and bicycles. Since the passage of the Disability Discrimination Act (1992) by the Commonwealth Government, accessible public transport has been made a legislative requirement. Though a long lead in time has been allowed for existing vehicles, noticeable improvements have been made. 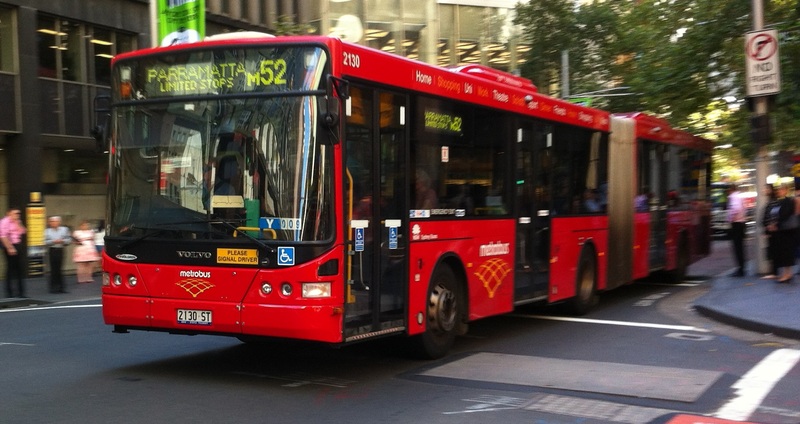 For example, the proportion of low floor buses in service has increased from 38% in 2007 to 73% in 2012 (Source: Transport for NSW, Disability Action Plan, p. 17). Government operated STA buses are more likely to be low floor, 75% of publicly operated buses are low floor compared to 70% for private operators, but the gap between public and private has narrowed. Transport for NSW has set itself the aim of having entirely accessible services by 2022. Verdict: Good progress in the past, with the achievable goal of 100% accessibility by 2022. Although new limited-stop services offered only minor to moderately faster speeds, it’s a simple step and 18 agencies reported launching new limited routes. Limited stop services currently exist, and these are being expanded and standardised with plans to introduce “Rapid Bus” services with stop spacings of 800m to 1km (Source: Transport for NSW, Sydney’s Bus Future, p. 6). Verdict: Good usage in the past and into the future. Dedicated lanes are used by 13 agencies, and one reported that “most routes are on a bus lane somewhere.” When implemented on wide arterial streets, this moderately improves speeds. Bus lanes were first introduced into Sydney in 1992 and today there are 90km of bus lanes on Sydney streets (Source: Roads and Maritime Service, Bus lanes). Additional bus lanes are regularly considered and added as needed and appropriate. Almost all of the surveyed agencies have adjusted running time, recovery times (the time spent turning the bus), or moved to more flexible ”headway schedules.” All of these actions improve on-time performance reliability for customers, and reduce the need for buses to sit if they’re running early. Some tight schedules currently mean that buses sometimes do not begin their route on time, negatively affecting reliability. Infrequent services make this worse, with “bunching” of buses forcing passengers to wait long periods between bus services. More frequent bus services, which rely on short headways for “turn up and go” services rather than reliance on a timetable, would improve this. This was partly achieved with metrobuses, introduced in 2008 to run at 10 minute frequencies in the peak and 15 minutes in the off-peak, but these are limited in coverage. It will be further improved with rapid and suburban bus services as they are introduced over time (Source: Transport for NSW, Sydney’s Bus Future, p. 6). Verdict: Room for improvement, with plans promising but lacking in detail. Synchronized stoplights along transit routes can make sure that buses face more green lights than red, but only have a mild impact on operating speeds. As with traffic light priority, this is theoretically possible but has not been implemented. This strategy had the largest impact on speeding up buses for the three agencies that tried it. Bus lanes along the M2 motorway in Sydney’s North West, along with bus stations in the median and routing most of these buses through the Lane Cove Tunnel through to the Sydney CBD, has easily achieved this goal. However, other motorways have not been designed with bus services in mind, particularly the M7 which provides a North-South connection in Western Sydney. This is the one area where Sydney has taken a step backwards. Verdict: Excellent achievement with the M2, but few accomplishments since then. Overall, Sydney is doing well in improving its bus services. They are accessible, contain bus lanes as well as BRT, often feature prepayment of fares, and have limited stop services with fewer stops to improve speed. For the most part, Sydney has also been moving in the right direction. But in order to improve services further, serious consideration needs to be given to traffic light priority and signal timing, allowing all door boarding once Opal is rolled out, and designing new motorways with bus services in mind. 13 rapid bus routes featuring high frequencies all day and with stops as far as 1km apart are to be created in coming years as part of a state government initiative to revamp Sydney’s bus network. These will be supplemented by an additional 20 suburban routes, which retain the traditional 400m stop spacing and often act as feeder services to heavy rail, light rail, or rapid bus routes. 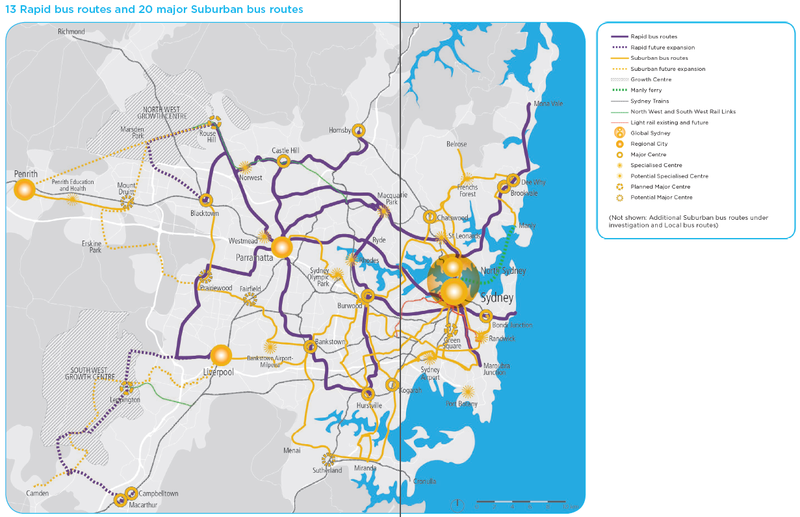 Altogether, 1.5m people will live within a 10 minute walk of a bus stop for one of these 33 routes, while 90% of Sydney’s population will remain within 400m of a bus stop. Longer stop spacing will allow for faster journeys. For example, the duration of a trip from Ryde to the CBD would drop from 37 minutes to 25-30 minutes. But it would require some passengers to walk further to reach the nearest bus stop, sometimes 400m-600m further. Frequencies would also be guaranteed between the hours of 6AM and 7PM, with 5-10 minute frequencies in the weekday peak and 10-15 minute frequencies in the weekday off-peak or weekends. Currently, only metrobuses offer this sort of frequency guarantee, and then only run at 20 minute frequencies in the evening and on weekends. This would therefore represent a significant improvement to Sydney’s all day high frequency network, as measured by areas within 400m of a transport service every 15 minutes every day of the week. This network currently exists for parts of Inner Sydney, but is woefully inadequate for most of Western Sydney. This all makes a rebranding of Sydney’s buses much more likely. Previously, buses were branded based on the operator. Currently all buses are being given the Transport for NSW sky blue bus colours, except for the red metrobuses and green shuttle buses. This new proposal would convert this into a different 3-tiered system, with rapid, suburban, and local buses. 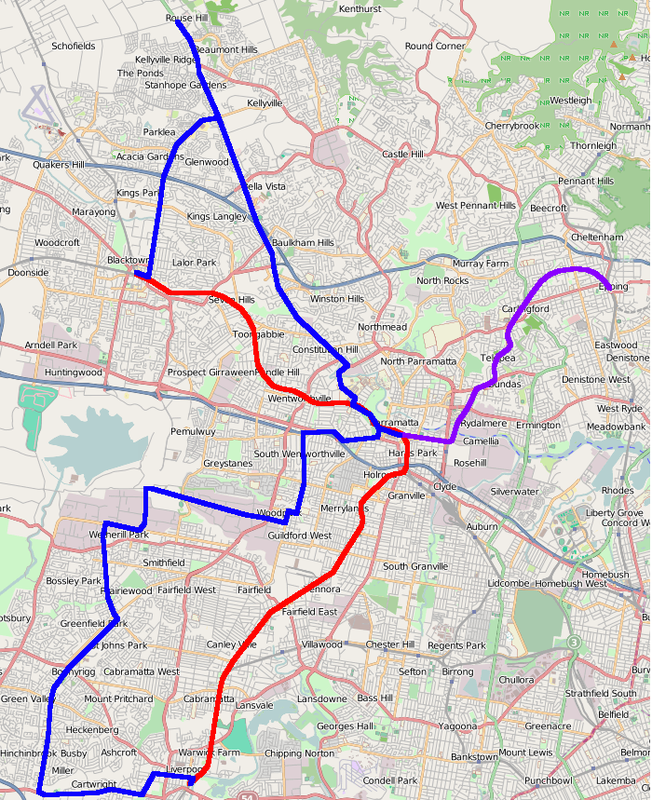 Bus Rapid Transit is also put forward as a future possibility for 3 corridors: Parramatta Road, Victoria Road, and the Northern Beaches, while the report also suggests a possible extension of the currently under construction light rail line on Anzac Parade South of Kingsford as well as construction of the Western Sydney Light Rail Network proposed by the Parramatta City Council. When the Southeast light rail line is completed at the end of this decade there will almost certainly be an increase in patronage along the Anzac Parade to CBD corridor. Whoever is transport minister at the time will point out that the number of bus plus tram passengers in the first few months after opening is higher than the number of bus passenger in the equivalent number of months before opening. They will then say that this is due to trams being faster, more reliable, frequent, and having a higher capacity than buses. The newspaper headlines will declare that this correlation has been caused by trams, and the (wo)man on the street will declare his (or her) support for trams as “much better than buses”. Except it’s not quite true. Patronage will almost certainly be higher, and it will be caused by better speed/reliability/frequency/capacity. But only the last of those 4 (capacity) is an inherent benefit of light rail. Speed is a function of things like stop spacing, on board vs off board fare payments, and top vehicle speed. Reliability is a function of things like exclusive rights of way and grade separation. Frequency is a function of how many vehicles are available and the demand for transport along that particular corridor. All of these are just as applicable to buses as they are to trams. In other words, you don’t need a $1.6bn upgrade to light rail to achieve them. The first point is frequency. Ironically, frequency is actually hindered by tram’s higher capacity, as one tram is able to carry as many passengers as multiple buses, and so the higher number of buses required to carry the same number of passengers will (all else equal) result in higher frequencies for buses than trams. The second point is reliability. A reliable service can be provided through the use of bus lanes and grade separation at intersections (i.e. a bridge over the intersection or a tunnel underneath it). Both of these are in place in the Northwest T-Way for buses between Parramatta and Rouse Hill. The third point is speed. Both buses and trams are capable of the 80kn/hour top speed along this route. So the actual determinant of average speed is things like widely spaced stops and off vehicle fare payment. The former can be achieved by buses through express or limited stop services, while the latter has been achieved at busy bus stops through the purchase or validation of a bus ticket before entering the bus, and will soon be universal once Opal is introduced. All door boarding can also increase speed through reduced dwell times, but can be done on buses as well as trams. The points on improved amenity on the right are all to do with the fact that the light rail vehicles are new. But new buses also share these features, such as low floors, air conditioning, real time information, etc. All this leaves capacity, which is a real and tangible benefit of light rail over buses. Trams carry more people per vehicle, and as there is only a certain number of vehicles of any type that can run on a particular corridor before that corridor (road or rail) becomes congested and capacity becomes limited, putting trams on a busy corridor can increase its capacity (just as replacing light rail with heavy rail can increase capacity there). Jarrett Walker at Human Transit spoke of this concept as getting causation the wrong way round: high patronage causes the roll-out of trams, rather than the roll-out of trams causing high patronage. Despite all this, and to undermine the entire argument made so far, the higher capacity of trams does actually allow the government to focus its attention on that particular corridor and implement many of the things mentioned earlier. For example, the new light rail line will have an exclusive right of way for its entire alignment 24/7, something that would not be possible with just buses as they require multiple corridors to achieve the same capacity. For this reason, the move to convert the Anzac Parade bus corridor into a tram corridor will still provide tangible benefits that could not be achieved with buses alone. This week’s announced dual resignations of Nick Greiner and Paul Broad, the Chairman and CEO of Infrastructure NSW (iNSW), was the eventual result of a battle of ideas within the NSW Government. On one side was those who supported a large scale expansion of Sydney’s roads network via aggressive use of toll roads, a view shared by Mr Greiner, Mr Broad, iNSW, and the Daily Telegraph. On the other was those who supported a large scale expansion of Sydney’s public transport capacity with a focus on the rail network, a view supported by Transport Minister Gladys Berejiklian, Transport for NSW (TfNSW), and the Sydney Morning Herald. The two government departments each championed their view via separate policy documents. TfNSW published the Transport Masterplan, which called for light rail on George St and a Second Harbour Rail Crossing. iNSW published the State Infrastructure Plan, which called for a CBD Bus Tunnel and extension of the Eastern Suburbs Railway, which rejecting both light rail on George St and the Second Harbour Rail Crossing. TfNSW responded by itself rejecting the Bus Tunnel and not incorporating the extended Eastern Suburbs Line into the final version of its plan. The NSW Government adopted both of the TfNSW proposals, but never of iNSW’s. Given the option, e government sided with TfNSW every single time its department disagreed with iNSW. Part of the media circus around this revolves around a misunderstanding of the role of iNSW. It is often compared to Infrastructure Australia (IA), which is tasked with evaluating transport projects and determining which will get government funding, a process designed to take the politics out of the decision. But while IA is staffed by former Transport Department bureaucrats and in in charge of distributing funding from the federal government, iNSW is staffed by former Treasury bureaucrats and is in charge of obtaining funding from the private sector. The role of iNSW is not, and should not be to determine, design, or deliver transport projects. Where it has, it has failed. 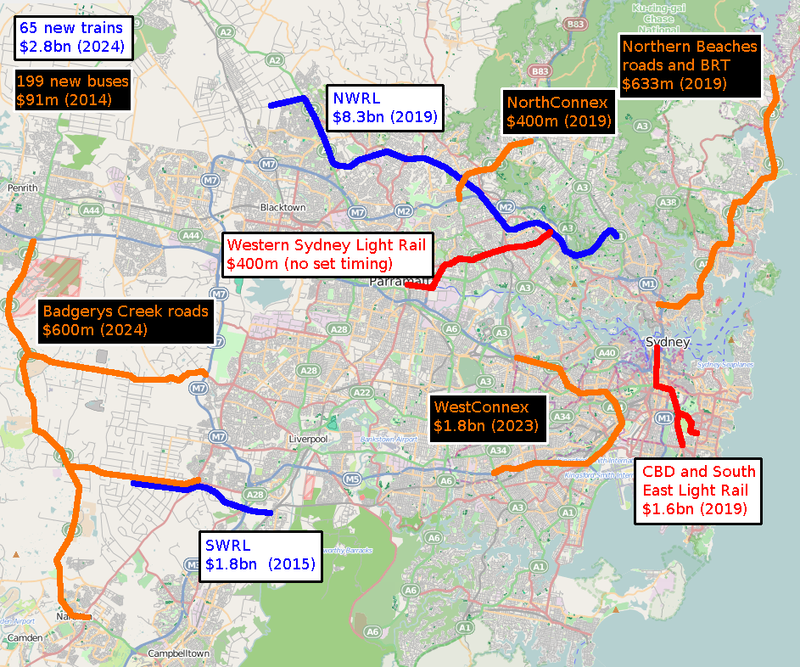 The CBD Bus Tunnel was discredited and rejected by TfNSW on the basis that it lacked integration, did not provide opportunities for urban renewal, lacked a viable corridor for construction, and cost 4 times as much as the light rail option, amongst other reasons (Source: Sydney’s Light Rail Future, pages 25-26). The WestConnex’s slot idea for Parramatta Road, initially conceived as an innovative way to build the M4 East at a lower cost than a tunnel, turned out to be more expensive than a tunnel and has now been scrapped because iNSW did not do its homework. Even the first project set to be administered by iNSW, the temporary Glebe Island convention centre, will now not happen. It is now clear that iNSW has been ineffective at determining, designing, or delivering transport projects, and should leave this to the experts at TfNSW while it sticks to what it can do – obtain private sector funding for PPP projects. This might have been fine, had Mr Greiner considered himself a valued contributor to the NSW Government. But as has been demonstrated, the Premier Barry O’Farrell sided with his Transport Minister over his Infrastructure Tsar every time Ms Berejiklian and Mr Greiner had a disagreement. Disappointed by his inability to convince the NSW Government on issues like those mentioned, as well as things like privatising the state owned poles and wires in order to fund additional infrastructure, it was clear that someone had to go. And that meant that Mr Greiner and Mr Broad’s resignations became an inevitability. They will be missed by some, such as the Daily Telegraph’s state political editor Andrew Clennell, who believes that “it’s ended in tears” and that “the danger is now, with a cautious poll-driven premier, nothing will get built”. But few tears are likely to be shed by those who have advocated for a greater focus on public transport, rather than on roads.